’Tis the season for plenty of merry-making and joyful gatherings. There are parties to plan, invitations to RSVP and, of course, gifts to wrap. We’ve made a list - and checked it twice - of timepieces in festive red, white, gold, green and blue that is certain to impress your hosts and guests, not to mention delight those at the receiving end of your generosity. If you’re looking for a gold watch paved fully in diamonds that doesn’t scream kitsch, this Oyster Perpetual is just right. 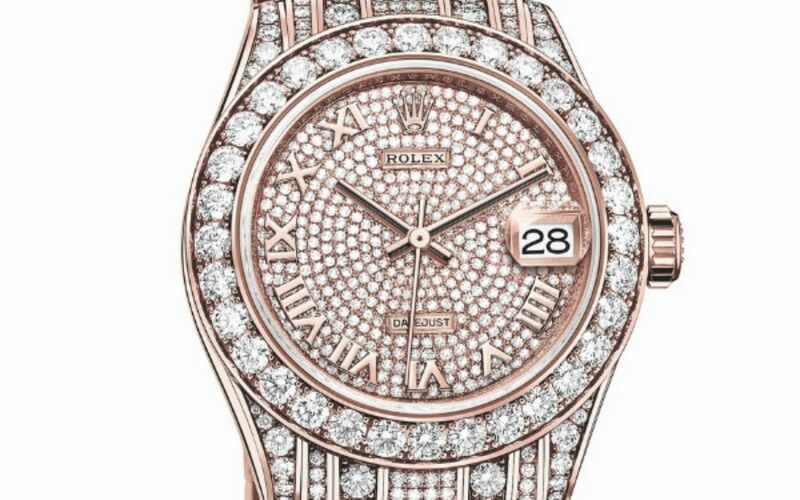 The crowning jewel of Rolex’s luxurious timepieces for ladies, the brilliant-cut diamonds are set on the proprietary Everose gold that charms with its very own glamorous shade of pink. The signature dancing diamonds get the Yuletide treatment in this boutique-exclusive timepiece. A dial of textured blue sets the wintery backdrop for the dancing snowflake-shaped diamond accompanied by a jolly mix of transferred white lacquered snowflakes in different shapes and sizes. A favourite of Cate Blanchett and Emily Blunt, the elegant Portofino possesses the timeless appeal of a classic. This three-hand automatic rendition comes in a 37mm stainless steel case and set with diamonds all around the bezel. The sparkle matches beautifully the sun-pattern finish of the dial. For a final flourish, the exclusive Santoni alligator strap comes in a shade of red that even Santa would approve. A vintage re-edition, the ultra-feminine Extremely Lady is crafted entirely in pink gold; the metal has been cleverly manipulated to feature a wood-like decoration for the bracelet. The bezel is set with 24 brilliant-cut diamonds. The opulence extends all the way to the dial, which is made entirely of red ruby. The Art Deco-inspired triangular case of 18k white gold is embellished with 50 brilliant-cut diamonds with the arches inspired by Harry Winston’s iconic Fifth Avenue boutique looking soothing in blue sapphires. The octagonal minute track on the dial is a nod to the emerald cut, Mr Winston’s preferred cut for gemstones. The simplicity of the two-hand automatic is elevated with a radiant dial in green, its shimmering quality attributable to the sunray finish. The rest of the design is a study in refined minimalism, from the skeletonised Dauphine hands to the slim baton hour markers. The enchanting rose gold lustre of Sedna gold is perfectly matched with a white mother-of-pearl dial set with 11 diamond indexes. The fact that it is powered by a highly precise and reliable Co-Axial Master Chronometer calibre certified by METAS for superior magnetic resistance only makes it more desirable. The King Gold case is dressed up in 48 baguette diamonds for a total of 1.90 carat, providing a dazzling frame around the snow-white dial. A unique feature of the Big Bang One Click is the interchangeable strap; for this occasion, complete the pristine look with a white structured line rubber strap.